I am the first to put my hands up and say that being a parent is the hardest job you can have. Although it is obviously rewarding it really is rather relentless and can put a strain on even the strongest of marriages at times. We are really lucky to have family close by who are always more than happy to look after the kids for a day or two so when an opportunity to get away with Steve crops up I don't hesitate in booking us up so we can enjoy some proper time together instead of time discussing what's for dinner, who's picking the kids up, helping with homework and acting as a referee between the three kids. When I stumbled upon Acorn Glade which is an ADULTS ONLY retreat near York, I knew it would be the perfect place to stay and really get away from the stresses of every day life. Set in four acres of land on the outskirts of the Vale of York, Acorn Glade feels like you are in the middle of nowhere yet you can walk to the local village of Melbourne and York city centre is only 11 miles away. 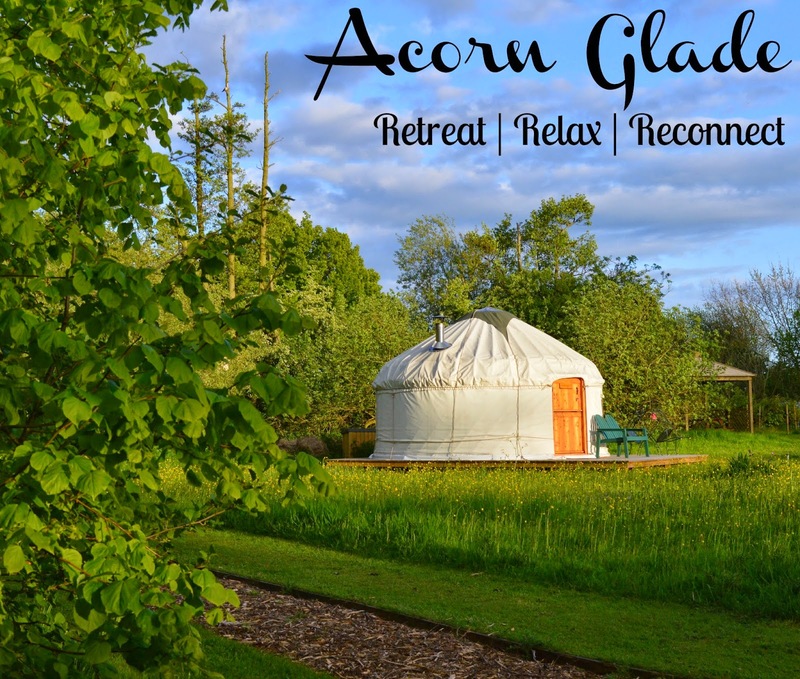 Acorn Glade is a designated wildlife site with a strong focus on 'green living' and with only two yurts and one cosy log cabin on site, it is never crowded and everything has been designed to encourage true relaxation. We arrived on a sunny evening and were welcomed by Richard and Julie with open arms. They gave us a quick guided tour, ensured we had everything we needed then left us their mobile number and informed us if there was anything at all we needed during our stay to just give them a ring as they were only two minutes away in their house. As soon as I opened the door to Daisy Yurt I could already feel myself unwind. The Yurts have been designed to ensure they are cosy, romantic and private yet functional too. They feature comfortable double beds with lots of cozy blankets (and a hot water bottle), comfortable seating and your own gas stove and kettle plus. Tea, coffee and cookies are provided too. At night the yurts were really magical with fairy lights twinkling above your head, candle-lit lanterns and your own roaring fire. It really was lovely and snuggly. There is an abundance of wildlife at Acorn Glade. The heart of the site is taken up with a private lake where you will find the most charismatic ducks and geese (and the cutest goslings if you visit at the right time of year). We spotted quite a variety of birds during our short stay and a even managed to see a water vole on our last evening. Because there is a lot of wildlife around, the dawn chorus can get rather noisy and you may be woken by the sound of birds tweeting. It was an absolute privilege for us to do this and dozing in and out of sleep to the sound of birdsong really was wonderful and not an annoyance at all. The lake has it's own private rowing boat which is free for guests to use and you are provided with food to feed the fish in the lake should you wish. I'm a generally a very busy lady - always somewhere to go and places to see. We decided to plan nothing at all during our days at Acorn Glade. There is no wifi or tv at Acorn Glade so you really do get the opportunity to properly switch off from the world. We had stopped off at Northallerton on our journey to Acorn Glade and stocked up on treats from the local market, wine shop and Betty's. Being able to spend time reading a book, practice my photography, have an afternoon nap, sit in the countryside with a bottle of wine with my husband, row a boat around a lake and spot lots of wildlife (and fairy doors) during our walks really was the best way I can think of spending my free time. There was no schedule to keep, no alarms or clocks to watch and no deadlines. If you can't truly relax at Acorn Glade, I'm not sure there is anywhere on earth you would be able to! As the sun set, Acorn Glade is plunged into darkness. You can walk to the local pub The Melbourne Arms (but pack a torch), snuggle around the wood burning stove in your yurt or head over to the communal fire pit to build a fire. We spent our last evening around the campfire with the other two couples who were staying at Acorn Glade. It really was everything we wanted from the experience and more - what's not to love about being toasty warm around a fire, sharing a bottle of whiskey with new friends and chatting about everything from where you have travelled to game of thrones theories and our lives back at home. If you stay at Acorn Glade I urge you to plan a night like this with the other guests. We were there until after midnight and had a really good laugh. Acorn Glade is a glamping site which means that you do have a lot of home comforts to hand. The Chicken Shed (pictured behind our yurt below) is home to a fantastic communal kitchen, private bathrooms and a craft room. The facilities are shared between the two yurts and log cabin and you have access to plug sockets (for all important phone charging), a fridge to keep your essentials chilled, cupboard space, electric hobs, a microwave and every utensil you could ever need. There are two shower rooms and two toilets which were always immaculately clean. We didn't have any problem with hot water during our stay and there was always a good supply. There are plenty of picnic tables dotted about for secluded picnics and covered seating areas in a wooden gazebo should the weather take a turn for the worse plus a half drum BBQ you can use should you fancy some al fresco cooking. As well as the local Melbourne Arms you can drive to the next village of Allerthorpe and try The Plough Inn. We spoke to a few people who highly recommended their burgers. 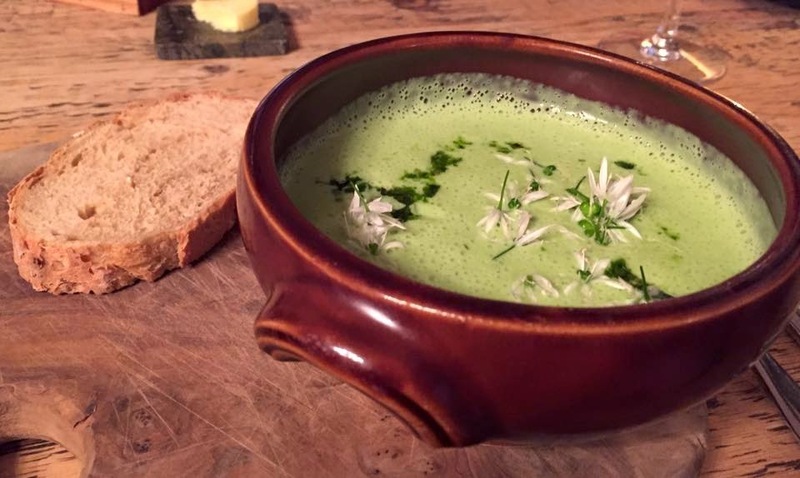 On our first evening we were keen to make the most of our child-free time and decided to book a table at The Pipe and Glass pub which has won a string of awards and retained one michelin star since 2010. It is about 18 miles away Acorn Glade but definitely worth the drive. It is very reasonably priced too - a two course meal for two with a glass of wine was just over £60. Reservations are essential. We also paid the visit of Pocklington a visit which was about 5 miles away from Acorn Glade. A charming little town with traditional pubs, cafes and an ice cream parlour, we chose to dine at Pane e Vino in the market place - a small and friendly Italian restaurant complete with eccentric singing waiter. We were made to feel extremely welcome and happy hour pizzas were only £5.95. Acorn Glade was one of the best places we have ever stayed. Give me nature, tranquility and total relaxation over a fancy hotel room any day! If you are looking for somewhere to visit with your other half I urge you to try here. Even if you've never tried camping or glamping before I promise you will love it. Daisy and Poppy Yurt are available from £125 for four nights. You can check availability, prices and book online here. Make sure you follow Acorn Glade on Facebook to keep up to date with their news and offers. It looks lovely and glad you got some time to unwind. I always find it hard to switch off but I imagine you don't get much choice there. And great the weather was good too. It looks very idyllic and serene something the kids would definitely destroy. What a lovely spot to recharge and to face the kids again. That looks absolutely amazing! Beautiful photographs and.. just wow! My husband and I would both love it and we don't live far away... we could both really, really do with some quiet, switched off time. The place looks amazing... love the bonfire at night! And how funny the sign for the goose poop hahaha. Thank you for linking up to #MondayEscapes :D have a great week! We are going away with friends very soon and they are camping but I have insisted on a caravan. I used to love camping as a child but I think the novelty can wear off very quickly if the weather is bad. This looks like a perfect compromise!! Oh they look lovely. So cute as well. Nice to have that quality time on your own. This looks absolutely fab! What a wonderful way to have a proper escape from the 'real world'. This is so perfect! It looks like such a fun, cosy romantic getaway and close to home. Your pictures are really great Samantha. Love all the little details!